Selena Gomez Matched The Weeknd in Sneakers He Designed, Proves She’s the Most Supportive Girlfriend Ever. When your SO designs sneakers, you definitely want to be the first to debut them. That's what happened when Selena Gomez was spotted in shoes from The Weeknd's collection with Puma. She wore a pair of PUMA x XO Parallel high-tops with a blue tee and joggers set from Cotton Citizen while casually sitting on her executive assistant's lap (who also sported the same shoes). Selena accessorized with a cool pair of Roberi & Fraud sunglasses. Celebrity couples are often quick to support each other's victories. 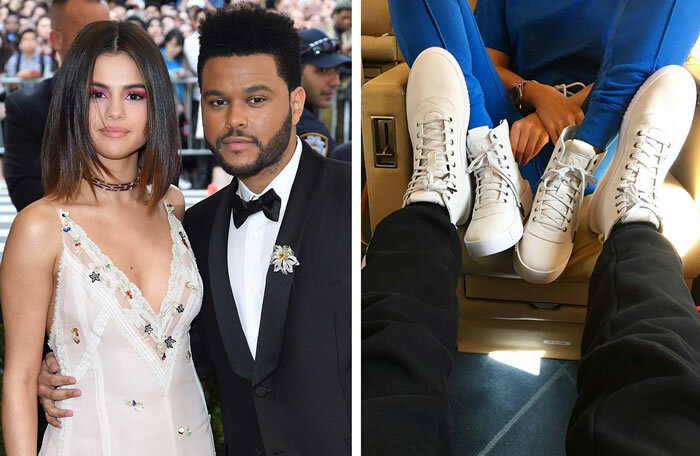 As if Selena's kicks weren't already cute enough, The Weeknd also shared a photo of his feet intertwined with Selena's. They were both wearing the sneakers he created! But this isn't the first time the two have matched — they also like to coordinate on date night. The $260 shoes, which dropped Aug. 24, aren't available yet online — you can only buy them in select stores like Barneys and KITH — so we found similar footwear for you to shop below.